You know the excited feeling that comes from finding a piece of clothing that fits just right, comes in a colour you love, and is exactly what you need? The icing on the cake, of course, is if the price is right. You just grab that item and run for the check out, heart pounding with joy. There were similar feelings of shopping bliss for about 70 people in the Whalley area, who shopped at NightShift’s Free Night Market, held in the Education Room for one night at the end of April. 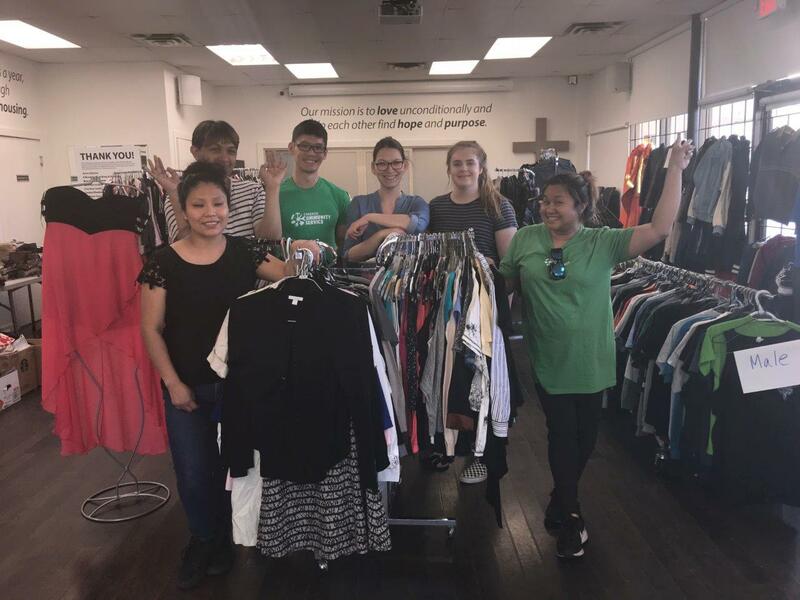 Making the night extra special for shoppers – who were all people without homes, or living in poverty – every item, displayed as in a retail store, was free! The event was created, organized and hosted by one of NightShift’s beloved volunteers, local Starbucks Manager, Marianne Wilson. She gathered the support of about 22 Starbucks employees from Surrey district stores to set up and serve customers at the event. The Free Night Market was purposed to give NightShift’s homeless and poverty-stricken friends a fun and dignified shopping experience, and it also celebrated Starbucks Global Month of Service. About 2,500 items were displayed in the Free Night Market, to the delight of dozens of folks who were invited to choose any 10 items. 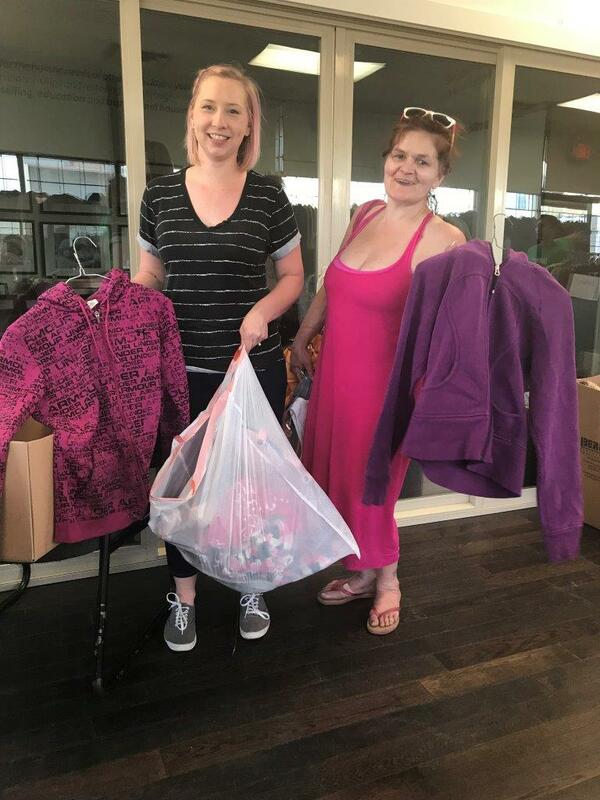 One shopper, Denine, was smiling ear-to-ear after choosing a couple of new hoodies that fit perfectly and came in colours she loves – pink and purple. Denine explained that NightShift events and outreaches are a big part of what brings happiness into her life. She is facing many difficulties, like being forced out of the camper she’s been living in with her partner for the last year. When the owner of the property their camper sits on died of a drug overdose last year, Denine not only lost a dear friend, but was also faced with the stress of finding a new place, within the allowance of her social assistance cheque. In addition to dealing with the trauma of childhood abuse, she longs to see her adult children, who she hasn’t connected with in 12 years. Most days, she fights a feeling of sinking depression, just to get out of bed. What a wonderful idea!! It’s ladies like you that bring the heart to Nightshift!! ♥️ God bless you!! Thanks Cheryl, God’s blessings to you too. Thanks for asking, Jill! Call our office at 604 953-1114, and ask for Marty or Keri to get more information on the next Free Night Market!